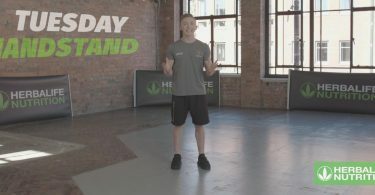 Welcome to the first day of the Herbalife Nutrition 21 day Challenge with Nile Wilson. Our amazing ambassador and Olympic Bronze Medal gymnast Nile Wilson is going to guide you through this wonderful journey, to help you to reach your health and body goals. Day 1 is an awesome cardio workout. Let’s do this! Each workout is between 15-20 minutes, you can do them at home at the time that suits Each workout video contains modified exercises to suit all levels of fitness. . You can raise the level of difficulty during the upcoming weeks, as you feel that your body is getting stronger. Remember, take the workouts at your own pace, be patient with your body; there’s no rush. Every section will start with a warm up. We strongly recommend to warm up properly each time you perform a workout to avoid the possibility of any injuries or unwanted muscle pain. We strongly recommend that you hydrate before, during and after workout. It is also very important to eat well – having good nutrition will assist you pre, during and post workout. If you are looking for nutritional products, visit http://www.herbalife.co.uk/, where you can get guidance from a local Herbalife Nutrition Member and find the right products to support you through the next 21 days. The most important thing is for you to find the right balance to change or better your habits. Come back tomorrow for Day 2 of the 21 Day Challenge and another great workout with Nile Wilson. Don’t forget, to get in contact with a local Herbalife Nutrition Member for support on the right nutritional products here.